To the extent that slow-burn horror movies are about atmosphere, Hereditary has many of them beaten. Using the camerawork of Pawel Pogorzelski and the music of Colin Stetson to fashion the skeleton of a superbly moody background, first-time director Ari Aster hits a home run when it comes to an overall sense of impending doom. Sadly, Aster’s story isn’t as waterproof as his stylistic aptitude. Riddled with logical problems and plagued with a weird wtf? ending (that comes dangerously close to recalling the absurdities of mother! ), the narrative skids off the track around the 3/4 mark and never recovers from the derailment. The plot contortions might all make sense during a second viewing but, with its deliberate pace, this isn’t a film many people will be in a hurry to revisit. When a movie is established as transpiring in the “real world,” it is incumbent on the filmmakers to adhere to basic, realistic logic in developing the narrative. For a film with supernatural elements, one expects that ghosts and other paranormal apparitions might be involved – those things are essential to the story. On the other hand, the movie shouldn’t shrug off mundane things. If an accident occurs that results in severe injury or death, one expects police involvement. What’s more, this shouldn’t just be swept under the rug until it becomes convenient to have a conversation about it. 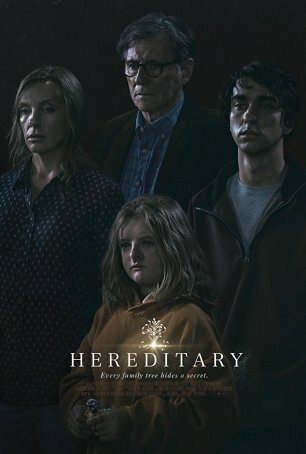 Problems of this nature undermine Hereditary’s credibility and damage our ability to take the characters and their situations seriously. The movie focuses on a strange and insular family, the Grahams. At the start of the proceedings, Annie Graham (Toni Collette) is preparing to bury her mother. Her husband, Steve (Gabriel Byrne), and teenage son, Peter (Alex Wolff), are grave, but neither seems especially upset. The only one broken up about Grandma’s death is Charlie (Milly Shapiro), Peter’s 13-year old sister. Those hoping for a whiff of ghosts or hauntings will have to wait a while. In fact, nothing especially odd happens for about the first hour as the movie toys with our expectations, loads up on claustrophobia and eeriness, and gives us time to get to know the characters as they endure yet another tragedy. For a while, it almost seems like Hereditary is some kind of modern gothic drama, although the characters seem strangely muted and unreal. It’s hard to say whether this helps or hurts when things start going bump in the night. Toni Collette’s committed performance helps to sell the movie even during its most unconvincing moments. Colette is one of a select number of currently working actresses who can play almost any role in any genre, whether it’s comedy, drama, or horror. Her face-off with Alex Wolff during the most uncomfortable dinner scene in any recent movie is a testimony to her ability to own the screen. Wolff and Gabriel Byrne are solid, although the script doesn’t do them any favors by forcing their characters to react irrationally in both normal and extreme situations. Some (mostly inferior) horror movies thrive on characters doing stupid things; this isn’t one of those. Hereditary wants to be taken seriously so when it jettisons real-world concerns to force its otherworldly agenda, it hurts the film. Hereditary is never more than passingly frightening. The jump-scare count is low. However, although the slow-burn approach works well for a while, it ultimately goes on for too long. Momentum flags as the running length approaches (and eventually goes beyond) two hours. I can’t go into specifics about why the ending doesn’t work without spewing out spoilers (which I won’t do) but suffice it to say the change in tone causes whiplash and the level of weirdness throttles the well-modulated, low-key style favored by Aster during the first 110 minutes. Poorly constructed endings can leave an unpleasant aftertaste even for movies that are otherwise mostly solid. That’s the case here.